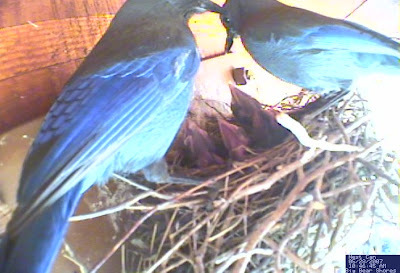 It's a webcam trained on a Steller's Jay nest at Big Bear Lake. It refreshes every five minutes. Unfortunately, I'm a little late in posting this. Sandra first observed the chicks around May 20 (around which time she captured these frames). 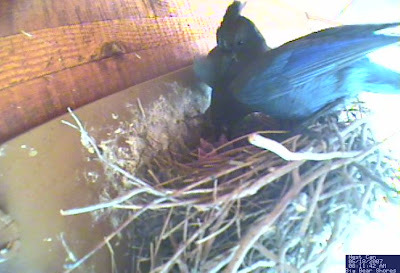 As of June 8 the chicks were down to two, were very big, and one was out of the nest for a while two days before. That seems like a rather rapid fledging to me, but I don't actually know the precise fledging periods of any birds off the top of my head, so here's a note to myself to look into that. I know that Steller's Jays, like all jays (including Blue Jays, Scrub Jays, and Green Jays), are members of the Corvid family, which includes crows, ravens, and magpies. I've been getting cozy with ravens over the course of the last six weeks, reading Bernd Heinrich's Mind of the Raven. I've found it a real eye-opener, in terms of seeing the value for me of ethology--the scientific study of animal behavior. I have some things to say about this book, which I hope to do as my (somewhat more flexible) summer schedule permits, in a week or so.